Left: The sampler at the Oskar Blues Brewery in Lyons, CO.
You wouldn't think it possible that an influential, groundbreaking brewery could exist in a town like Lyons, Colorado. A town of around 1500, built along two parallel streets, Lyons is barely a blip on the route from Denver to the Rockies. Nevertheless, Lyons is home to Oskar Blues Brewery, the first U.S. craft brewery to package its full lineup in cans (I'm going to trust the brewery here rather than research). So it was mid afternoon on an August Friday when I found myself alone in a dark basement bar ordering a sampler: OB's five year-round offerings: TenFIDY, Gordon, Dale's Pale Ale, Mama's Little Yella Pils and Old Chub; limited releases Woo Moon and One Nut Brown Ale; and specialty brew of the moment: Deviant Dale's. A dry-hopped version of their popular flagship pale ale, Deviant Dale's was only available at the brewery and I felt lucky to get a taste. 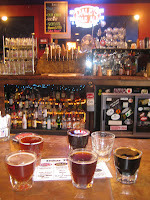 Side note: there are two OB breweries; one in Lyons, and one in nearby Longmont, home of Left Hand Brewery. All the beers from the Longmont brewery are shipped around the country. The Lyons versions stay in house. The bartender said there was a noticeable difference, and the Longmont offerings were less cared for. One sniff of my Gordon was all she needed to know this version had come from Longmont. Interesting. But back to Deviant Dale's. This was definitely brewed in Lyons, and as a dry-hopped pale ale, it was by no means revolutionary. If anything, it was cliched. Everyone is dry hopping. But you know why everyone is dry hopping? Because it's great. Tasty. Aromatic. However, while many dry-hopped pales offer a much richer smell, many don't carry the difference through to the taste. I had experienced this just two days prior, when Avery's dry-hopped IPA didn't deliver the taste that the smell promised. Deviant Dale's did. Lighter in color, and with a much bigger head than the original, Deviant Dale's looks like the beer that I love tasting: A little froth on the lips, a smooth glide down the throat, and the hope of a nice bitter linger. Hops teetering between grapefruit and pine, DD had what I like to call the bug spray finish. Stings a bit, gets into your nostrils. After the sampler, I chose this as my featured pint. And I could have had pint after pint. But, being in Lyons, the shopping was limited, and the women of the trip joined me long before my drinking was done. Such is life.